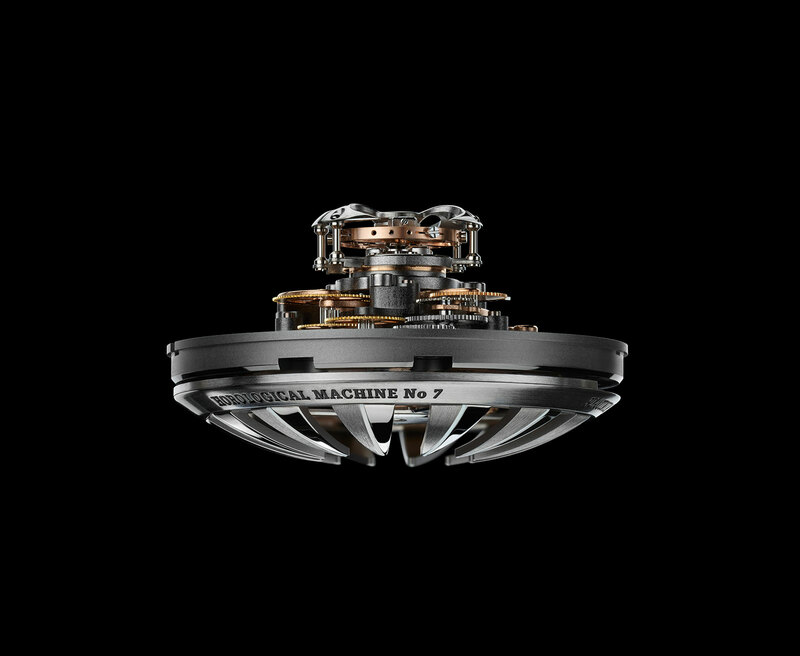 Inspired by a jellyfish, the HM7 Aquapod is round, unlike other Horological Machines, but that’s the only thing that’s conventional about it. 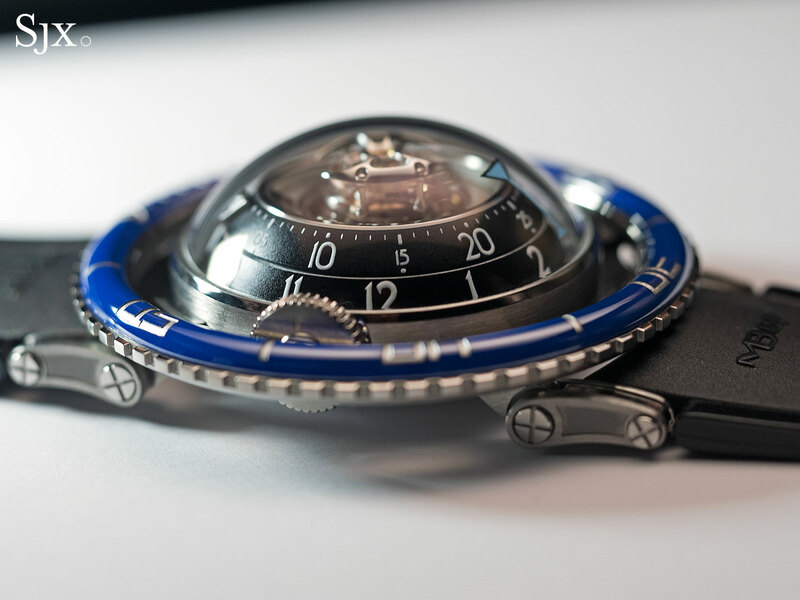 Though the jellyfish link is not immediately apparent, the Aquapod is immediately recognisable as a marine watch of sorts, with a rotating bezel that’s reminiscent of a lifebuoy. 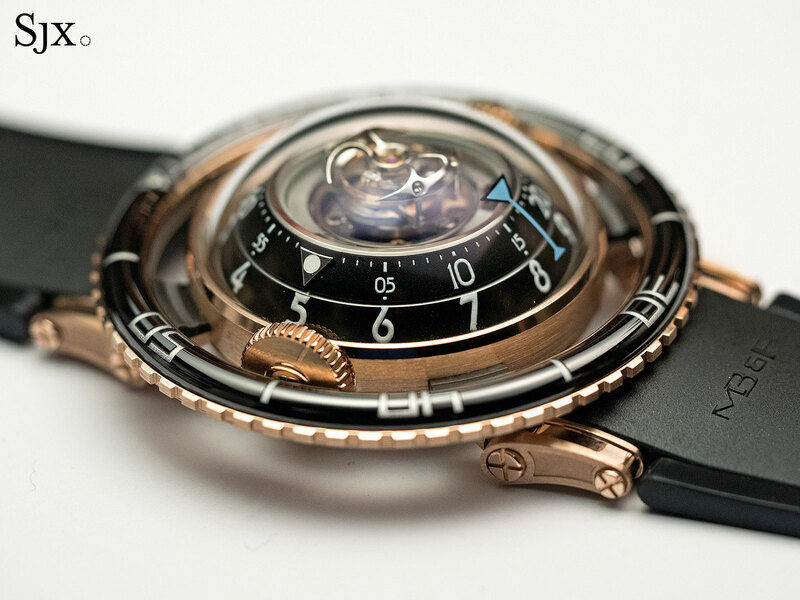 And like it or not, the HM7 manages to look original and different, which is challenging given MB&F‘s résumé. 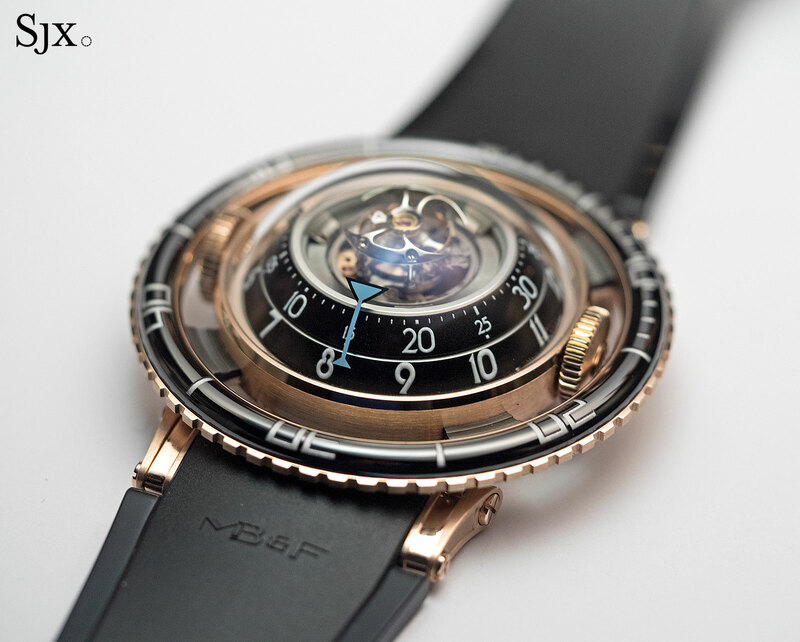 Beyond the design, the seventh Horological Machine from MB&F is also notable for illustrating how the brand has matured over the years, balancing both avant-garde design and wearability in its wristwatches. The HM7 Aquapod is enormous – over 50mm in diameter – but ergonomic. 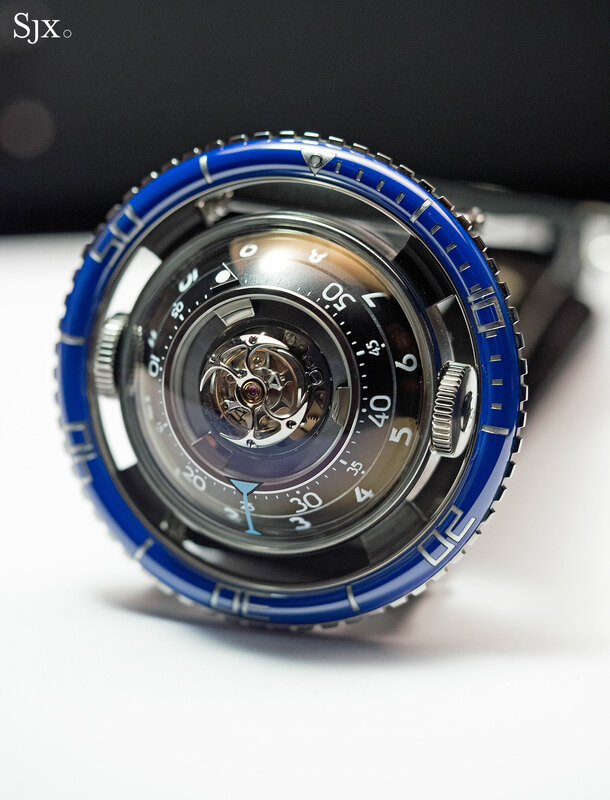 The HM7 Aquapod is available in two guises, titanium with a bright blue bezel, or red gold with a black bezel, and tells the time via two large rotating rings. Made of aluminium for lightness, one ring is for the minutes and the other for the hours, with a blue arrow pointing to the time. Though the time display is unusual, the size of the rings make it legible. And a generous application of Super-Luminova means it is readable in the dark as well. 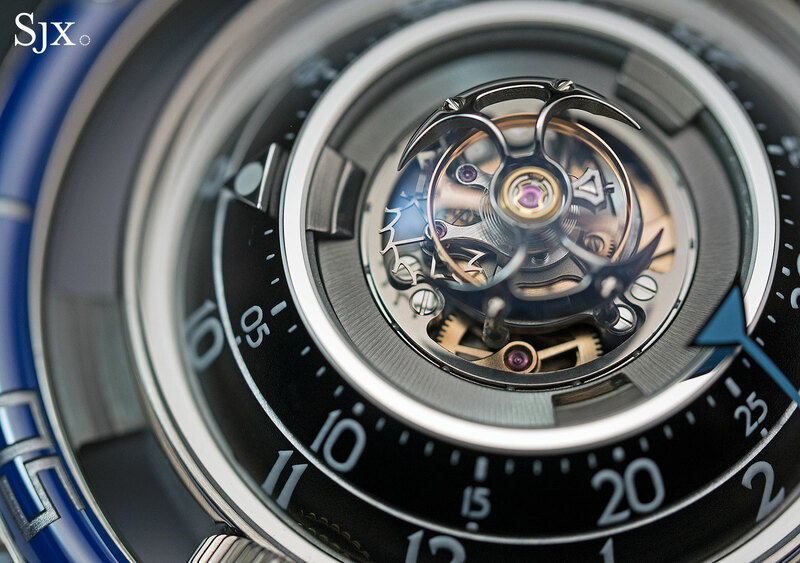 In the centre of the face sits a flying tourbillon that rises out of the watch, sitting at the highest point of the movement, which is constructed vertically like a skyscraper. 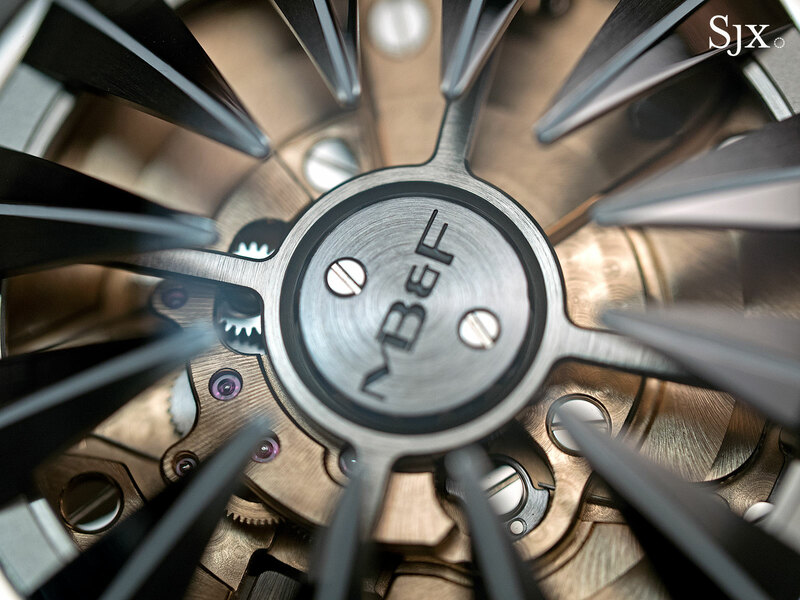 Developed in-house by MB&F – most of the brand’s earlier calibers relied on external specialists – the movement is automatic with a three-day power reserve. 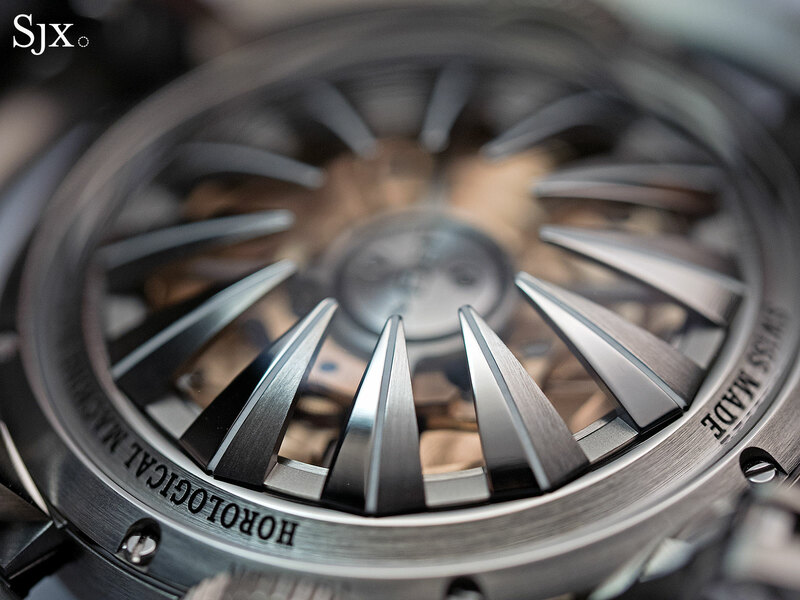 Extra-large ball bearings support the large but thin aluminium discs that tell the time, while the platinum rotor on the back is ringed by titanium tentacles. There isn’t much of the movement visible on the back, but what is visible indicates a careful if workmanlike finishing. A barely discernible wire spring for the winding click (visible at the bottom right of the picture below) is less attractive though. 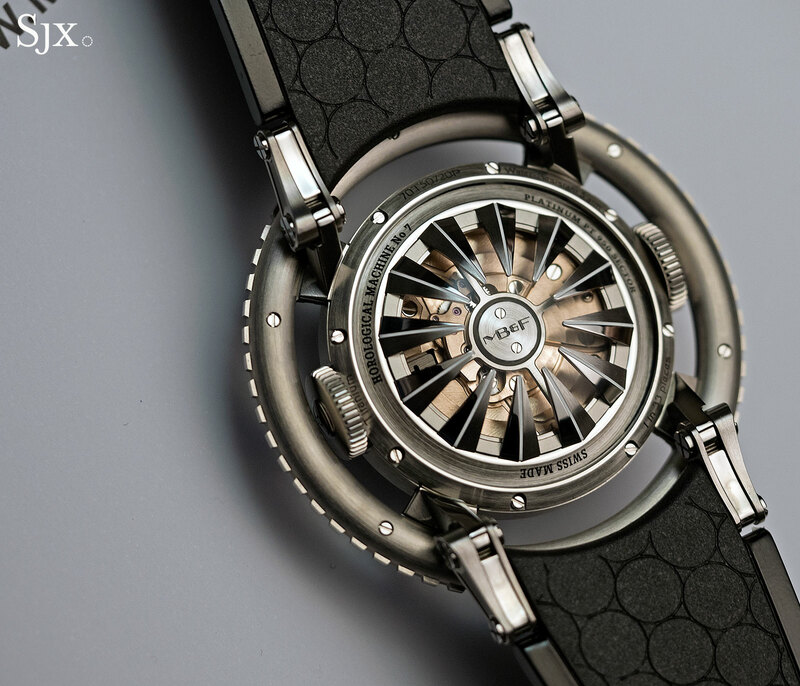 The case is pleasingly symmetrical, with one crown on each side (for winding and time setting respectively). And it is also nearly spherical and very large, measuring some 53.8mm in diameter. Some of the size is attributable to the bezel, which sits apart from the case body on struts. Covered with a ceramic insert, the bezel turns only in one directional, as is standard for dive watches, though the Aquapod is not, strictly speaking, a dive watch, being rated to 50m. Not only is the watch wide, it is also thick, measuring just over 21mm high, mostly due to the domed sapphire crystal on the front and back. 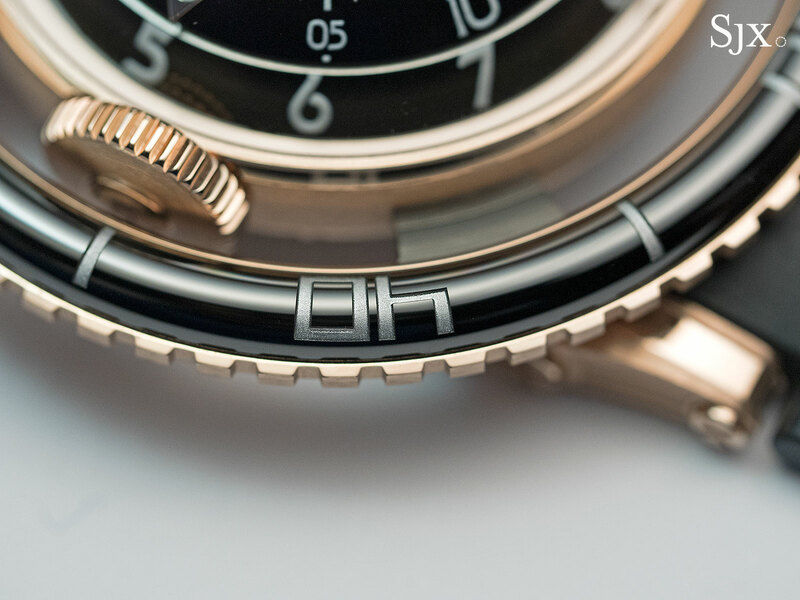 The front crystal takes up most of the height of the watch, having to accommodate the movement at its highest point. Despite its size, the Aquapod is ergonomic. 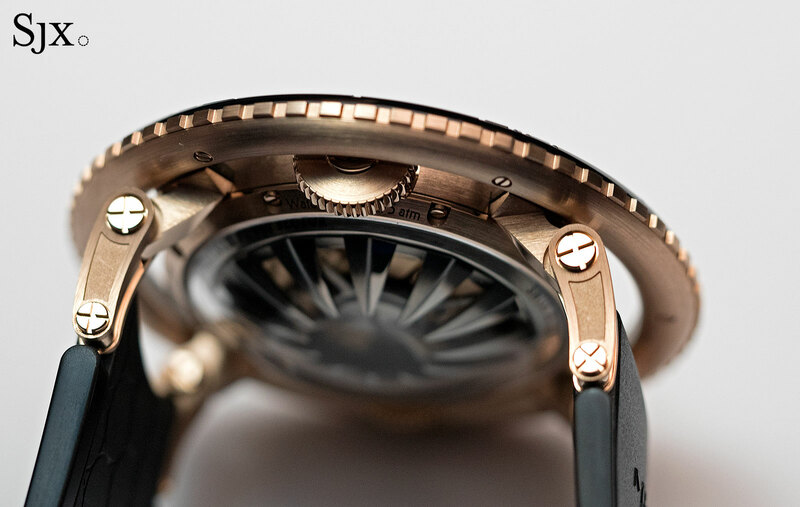 The case is relatively light, even in red gold, with articulated lugs that sit under the bezel. They allow the watch to hug the wrist closely and also make the effective size of the case smaller than the edge to edge measurement. The only drawback is its height, which is essentially twice that of an ordinary watch. The wearability of the watch is significant, demonstrating how the brand manages to balance both a distinctly novel design with practicality. 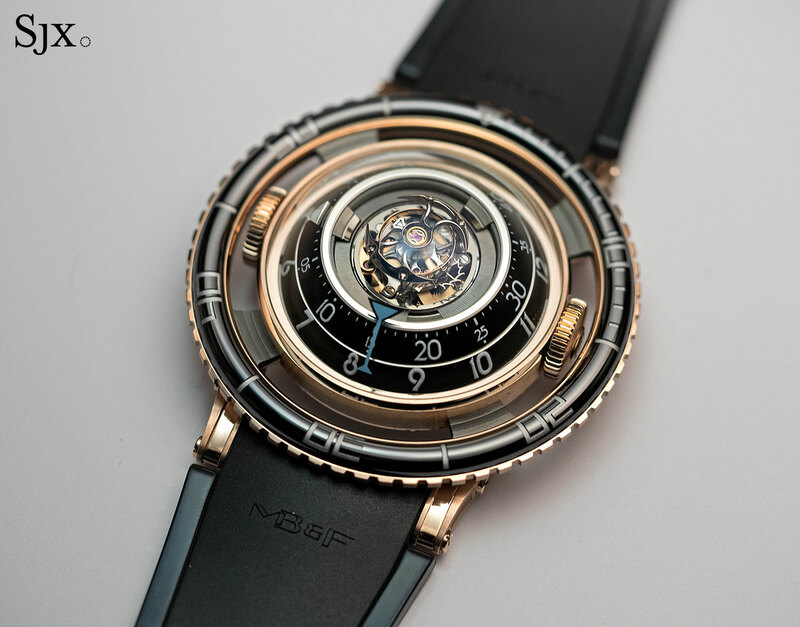 In its early days MB&F’s watches were just as avant-garde, but not always as wearable, like the HM1 for instance, which lacked equilibrium on the wrist. 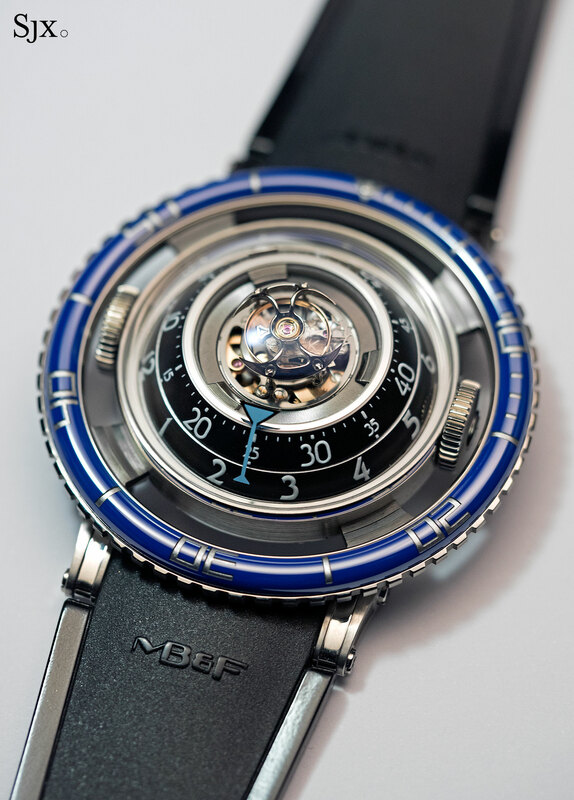 As is typical for MB&F, the quality of case finishing is excellent, with attention paid to all surfaces – above, under, in-between and inside. 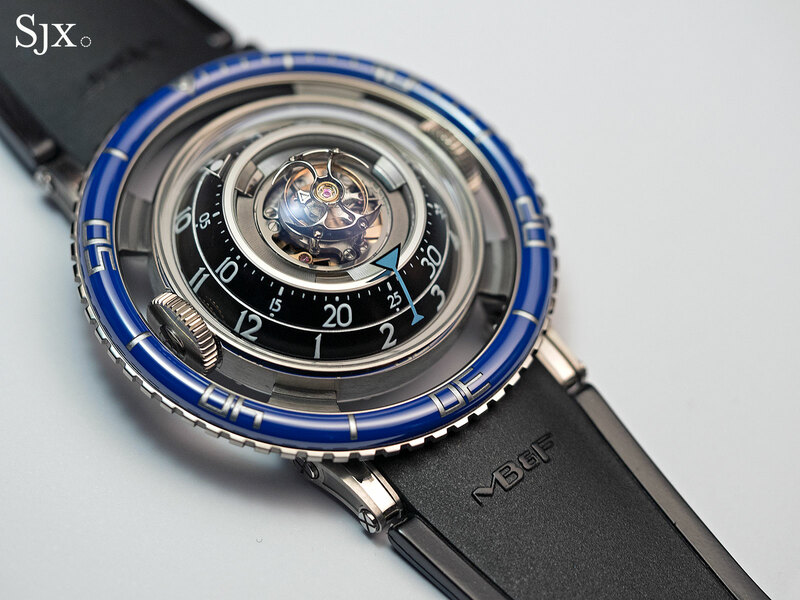 An aesthetic that is distractingly peculiar can allow the watchmaker to get away with cutting corners, but MB&F admirably doesn’t do that. 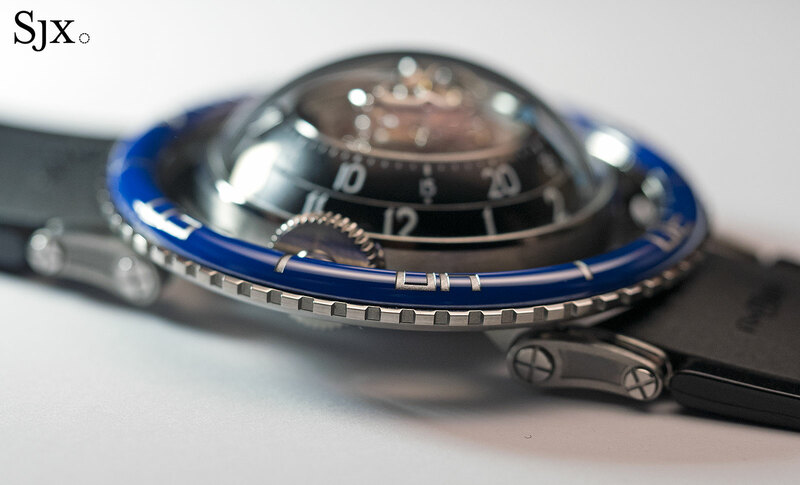 The HM7 Aquapod is available now from MB&F retailers and M.A.D. Galleries. 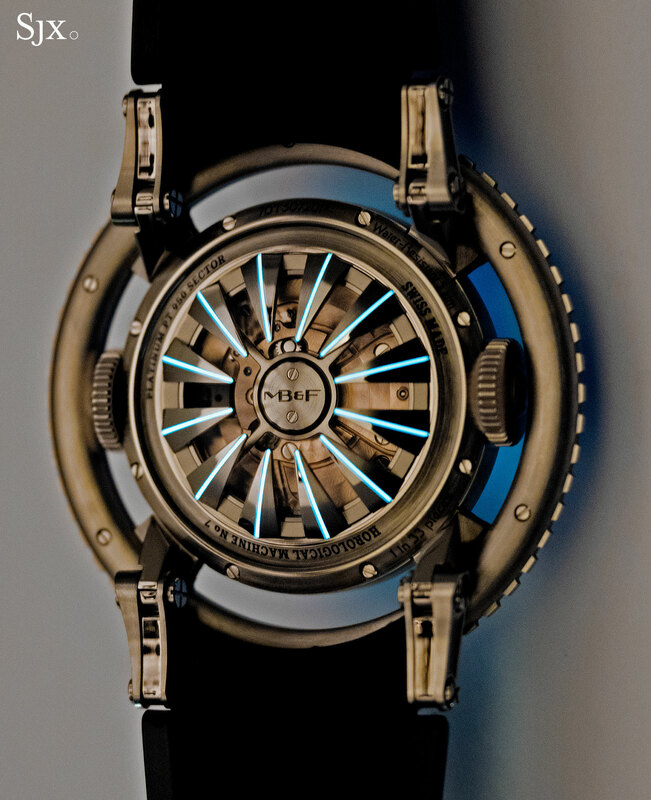 It costs SFr98,000 in titanium and SFr118,000 in red gold. In its first year, the production run will be 33 pieces in titanium and 66 in red gold. 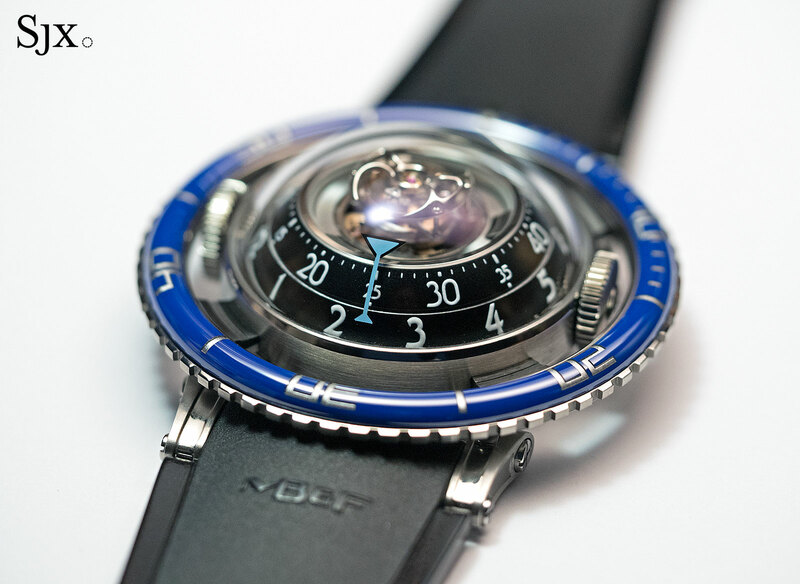 More will follow in subsequent years, and if MB&F’s track record is anything to go by, expect variants in vivid colours inspired by marine life. The Kickstarter-funded Superellipse boasts a high quality stainless steel watch case and ETA movement for under US$500.